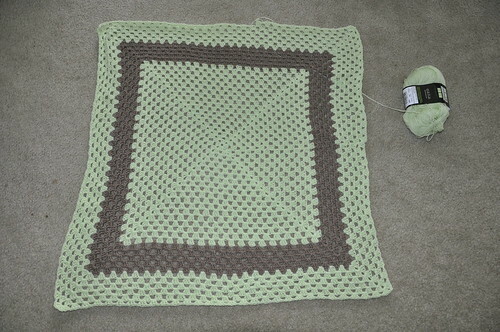 At knit night at the local library a few weeks ago, I received a granny square lesson from one of our wisest members. 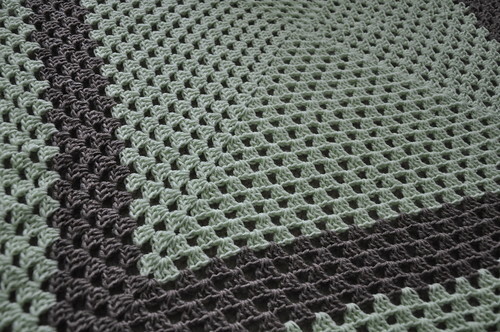 She mentioned that if you keep going around with the double-crochets, it will turn into a blanket. Which is exactly what I’m doing. 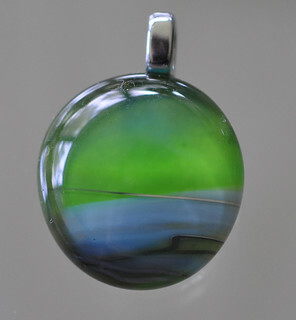 At STITCHES West in February, I purchased two beautiful glass buttons from Mingo and Asho. 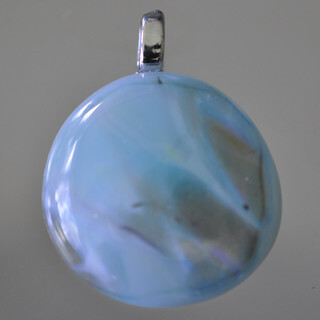 I was looking for a smaller pendant than the one I had found the previous year which, while gorgeous, can feel heavy after wearing for several hours. They suggested that I convert some of the buttons. With some glue-on bails and E6000, I was able to do just that, to spectacular results. 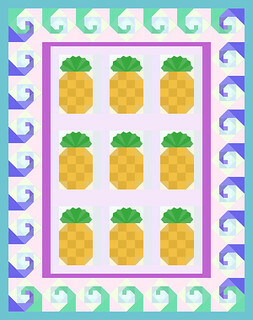 The idea for the pineapple wave quilt has been percolating for a while. On average, I’ll think about a project for two or three years before beginning. 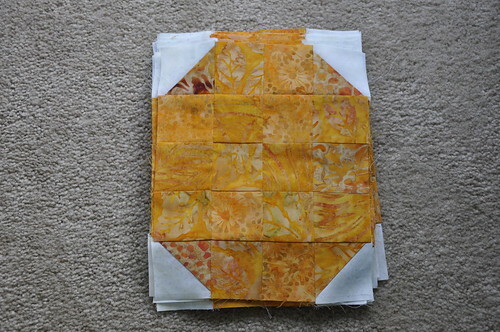 In January 2011, I started working out the math, made sketches, and purchased fabric. 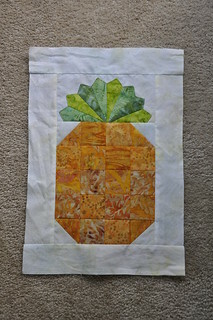 The bases for the pineapples have now been assembled. The next step is to start cutting for the Dresden Plate tops. I love how the Must-Have Cardigan and all of its cables is turning out, but stockinette stitch is great for some instant gratification. 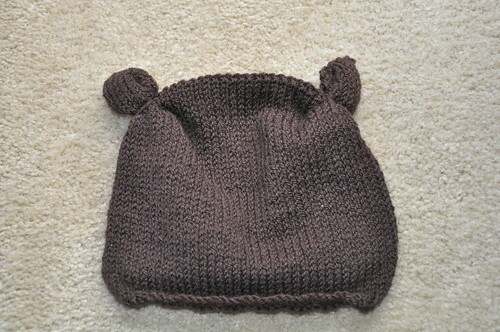 This All Ears hat is for an upcoming baby whose colors will be brown and green. My size 5 needle is occupied with Must-Have (and I didn’t have my ChaioGoo when this was cast on), so I tried this one on size 4s. 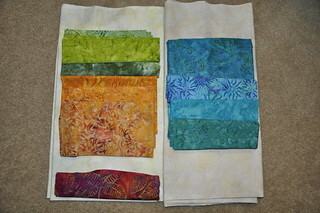 My gauge matches, but I knew that the fabric was turning out a little dense. Casting on 80 also seemed to make a larger size that I intended, but after three false starts I decided to see it through. A quick knit with cute results. This article is interesting, but it builds a divide between the worker and the boss, suggesting that if supervisors—and the supervisors’ supervisors—wouldn’t demand the extra work, then we wouldn’t have a problem. But what we really need is to change the entire working culture in the U.S. The population in general is eating lunch at their desks, connecting their personal smart phones to work email servers, and losing vacation time because they are at their maximum accrual limit. We feel that we have to do it to keep up with everyone else who does. We’ll all have to decide together to make it change. I wound the yarn for this one on the way home from STITCHES. MadelineTosh Vintage (short skein) in tart. Cast on 200 stitches on a size 5, 47 inch circular; turned out great. Good color and fit for a sweet co-worker. The first honey cowl is finished. I cast on 160 which turned out a little bit smaller than ideal. It’s a tad tight when wrapped twice, but plenty warm and might stretch with use or if blocked. The Manos is wonderful. 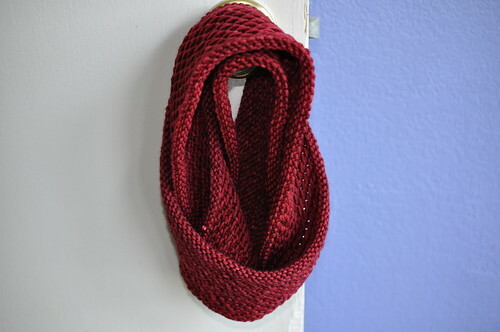 I can see how these can become addictive: only one skein and one week yields a highly satisfying project!